Foreword: My question is mainly an algorithmic question, so even if you are not familiar with suffix and LCP arrays you can probably help me. In this paper it is described how to efficiently use suffix and LCP arrays for string pattern matching. I understood SA and LCP work and how the algorithm's runtime can be improved from O(P*log(N)) (where P is the length of the pattern and N is length of the string) to O(P+log(N)) (Thanks to Chris Eelmaa's answer here and jogojapans answer here). I was trying to go through the algorithm in figure 4 which explains the usage of LLcp and RLcp. But I have problems understanding how it works. 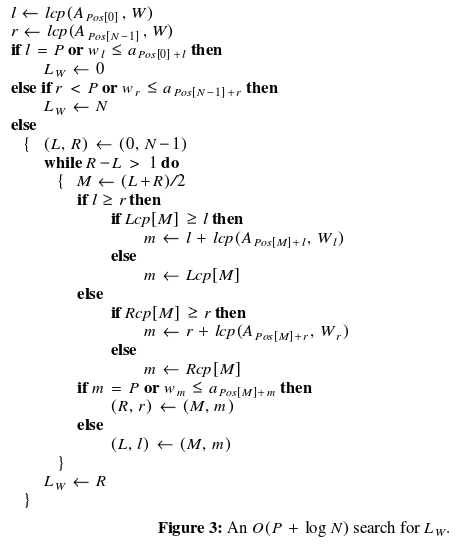 I want to try to match a string, say ban and would expect the algorithm to return 0 as L_W. I feel like I am missing something but I can't find out what. Also I am wondering how the precomputed LCP array can be used instead of calling lcp(v,w). I believe there was an error. First condition is fairly easy to understand. When LCP length == pattern length, it's done. When your pattern is even smaller than or equal to the smallest one, then only choice is the smallest one. The second condition is wrong. We can prove it by contradiction. r < P || Wr <= a... means r >= P && Wr > a... If r >= P, then how can we have Lw = N(not found), since we already have r length common prefix? Not the answer you're looking for? Browse other questions tagged algorithm pattern-matching suffix-array or ask your own question.